Out of respect to Mr. Anderson I thought I might not make any new entries on the website this week but I have made the decision to continue posting clips of his conversation with former Sheriff Wayman which I think shows them both in a good light. Last weekend my sidekick Loretta and I were lucky enough to spend a few days taking in the holiday sights in Branson, Missouri, one of the entertainment capitals of the whole country. The night we arrived our first stop was the famous Baldnobbers’ show which helped establish Branson as a destination for down home country music and comedy and what a way to start out! For those of you who have never been, Branson is situated among the Ozark Mountains and today dozens of theaters are located there including venues featuring veteran performers such as Andy Williams, Loretta Lynn and The Oak Ridge Boys. When the holidays roll around the whole town gets decked out for shopping, Christmas entertainment and of course great food. I am sorry to report that my collaborator of the past five years, Chub Anderson, died today, November 24, 2010, at 6PM. He had recently stopped his dialysis treatments and signed a “do not resuscitate” order. In his sixty-nine years Chub had packed in enough adventures, and misadventures, for several lifetimes. This video was made as Chub and the former Sheriff were aging and battling health problems. They were both facing the possible end of the road in their lives and the tone of their conversation reflects that. The feeling throughout their meeting was very respectful, without any anger or recrimination towards one another. They were able to thoughtfully discuss many details about the Mullendore murder, including some false leads such as the much discussed bone chip that some claim had landed on Chub’s hat. Check out the most recent installment in my profile of the Sheriff which gives you a greater understanding of the character of this man who has been haunted by the two crimes he could never solve. 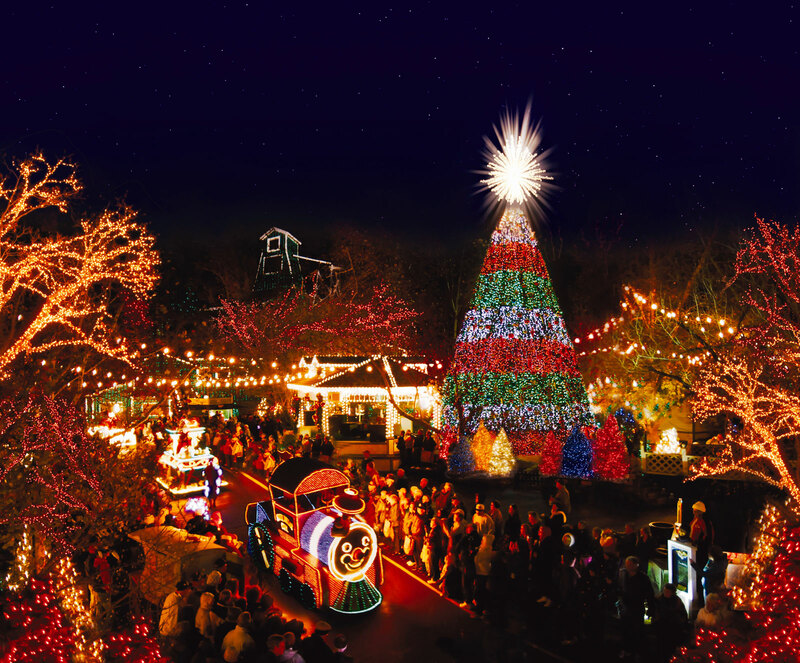 Then keep your eyes peeled for a new posting next week from my travels under Down The Road as I take a side trip to Branson, MO to check out this year’s Christmas events.This is one of my favorite places to visit and I am sure that many of you are already familiar with it. If you haven’t been there the holiday season is one of the best times to go. The disappearance of Cindy Kinney has lain heavy on his mind for over twenty five years and he frequently goes over the details of the case in his thoughts. Cindy was a good student with a clean reputation and a loving family. At the time of her disappearance her uncle was an officer with the Pawhuska Police Force and he was the first on the scene. When the Sheriff was called to the Laundromat that Cindy’s parents owned on Pawhuska’s Main Street he found few clues; just a half eaten sandwich and her purse. There was a new bank under construction across the street from the Laundromat but interviews and background checks of the workers there turned up nothing. Following the few slim leads and posting rewards proved futile. When the parents called in a physic Wayman would criss cross the country in vain pursuing her hunches. Wayman knows Cindy wasn’t the type of girl to run away and now after all these years, with hundreds of man-hours and thousands of dollars devoted to finding her, this case still baffles him. The day he retired from office he didn’t know anymore about Cindy’s whereabouts than he did the day she vanished and he knows that will haunt him till he dies. Welcome back. This week and next as promised, I’m bringing you a larger than life story; he became the sheriff of the largest county in Oklahoma and kept that position unopposed for twenty-four years. Sheriff Wayman as he is still known, was born in tiny Burbank in the heart of Osage County which just a few years before had been the Osage Indian Reservation. Part Indian himself, he began his career cowboying on local ranches. Then he moved on to work as a roughneck in the tough Osage oil fields. When World War II broke out young George served in North Africa with the 645th Tank Destroyer Battalion where he won the Bronze Star for valor after single handedly knocking out a Nazi Panzer tank. After his discharge in 1945, Wayman was reactivated during the Korean conflict and fought in the well known battle of Pork Chop Hill, about which several movies have been made. In the first segment of the recorded conversation between former Osage County sheriff George Wayman and Chub Anderson, the sheriff refers to a “deal” which had been offered to Chub shortly after the murder by J.D. Slinkard who was an investigator for Osage County at the time. Slinkard’s typed document sits in the murder case file at the sheriff’s department, the paper yellowing with time, still waiting for Chub’s signature. As the author of Footprints in the Dew I have tried hard over the last five years not to become a character in this story but as you will see this week I’m put right in the middle of it all by Sheriff Wayman. This week I am posting the first in a series of film clips from an interview between retired Osage County sheriff George Wayman and Chub Anderson. 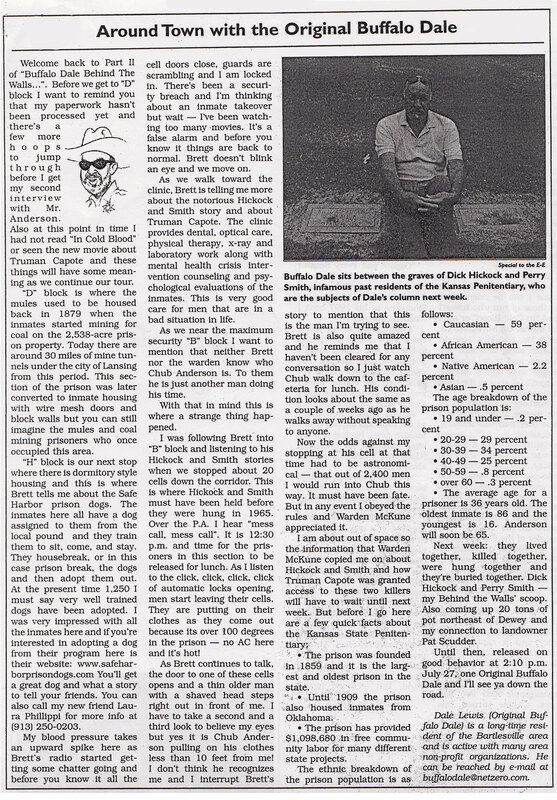 As I described last week, their meeting took place in Chub’s apartment in Caney, Kansas, in February 2009. It was only the second time in over forty years that the two men were face to face. Welcome back to Part II of “Buffalo Dale Behind The Walls…”. Before we get to “D” block I want to remind you that my paperwork hasn’t been processed yet and there’s a few more hoops to jump through before I get my second interview with Mr. Anderson. Also at this point in time I had not read “In Cold Blood” or seen the new movie about Truman Capote and these things will have some meaning as we continue our tour.